Adobe Photoshop software, the professional image-editing standard and leader of the Photoshop digital imaging line, delivers more of what you crave. Groundbreaking creative tools help you achieve extraordinary results. Unprecedented adaptability will let you custom-fit Photoshop exactly to the way you work. And with more efficient editing, processing, and file handling, there's no slowing you down. Easily change the color of any image area while retaining the original texture and shading. Create and edit 32-bit images, and combine multiple exposures into a single, 32-bit image with expanded range-from the deepest shadows to the brightest highlights. Monitor color changes to your image in the Histogram palette, which dynamically updates as you make adjustments. Quickly improve the contrast of over- or underexposed areas of an image, including CMYK images, while preserving the overall balance of the photo. Get precise, consistent color from display to output with helpful color management guidance. Achieve amazing results in a fraction of the time with the groundbreaking Vanishing Point, which lets you clone, paint, and paste elements that automatically match the perspective of the surrounding image area. Easily create packaging mock-ups or other dimensional effects by wrapping an image around any shape or stretching, curling, and bending an image using Image Warp. Effortlessly retouch photos-including 16-bit images-in a single click with the advanced power of the new Photoshop Spot Healing Brush. Instantly neutralize red eyes with the one-click red-eye correction tool, which supports 16-bit images and lets you set pupil size and darkening level. Easily correct common lens distortions, such as barrel and pincushion, and fix chromatic aberrations and vignetting. Easily counteract common image blurring with fine correction control based on the specific blur types: motion, lens, and Gaussian. Polish digital photos with advanced noise correction in high-ISO shooting plus JPEG artifact reduction. Process an entire photo shoot in a fraction of the time by simultaneously adjusting color, curves, cropping, and more-and continue working in Photoshop! With support for a comprehensive range of digital cameras, Photoshop lets you automatically adjust settings, convert to Digital Negative (DNG) format, and apply nondestructive edits to batches of images. Perform precise editing and retouching with support for 16-bit images in core features, including layers, brushes, text, shapes, and more. Scan multiple images at once and let Photoshop automatically straighten and save each image as an individual file. Composite images, text, and effects on hundreds of layers that you can organize with up to five levels of nesting and save in different combinations as Layer Comps. Achieve amazing results with more than 95 special effects filters. Easily preview and apply more than one filter at a time from the Filter Gallery. Add vector-based text that you can edit at any time, format, warp, place on a path, convert to outlines, and use for masks or other special effects. Create sophisticated web page elements with rollovers, transparency, image slicing, and more. Set up and save custom menus and keyboard shortcuts for quick access to the features you need. Reduce onscreen clutter by choosing from task-based workspaces, or create your own with just the tools you need. Quickly get answers from the new, floating Adobe Help Center window with improved search features and convenient, task-based topics. Automatically track all editing steps within your Photoshop files. Export steps to a text file or save them as part of image metadata for easier documentation of your work, file audits, and more. Use the new Image Processor command to process camera raw images, and use new built-in Actions to prepare images for film and video. Accomplish more in fewer steps with event-based scripts that automatically activate at specified points in your workflow. Instantly produce repetitive graphics with Variables, which automatically populate your design with data from spreadsheets or databases. Automate common production tasks by recording editing steps in the Actions palette, and then processing batches of files with Droplets. Create and work with different aspect ratios to accommodate non-square pixels without distortion. Design for broadcast more easily by previewing your Photoshop images on an NTSC or PAL monitor connected to your computer by IEEE 1394/FireWire/i.LINK. Create and edit 32-bit, High Dynamic Range (HDR) images for the widest range and richest detail. Easily design using video-specific presets that show action-safe and title-safe areas of the screen. Perform precise matte painting, 3D rendering, and other advanced film compositing with support for 16-bit images in core features. Quickly integrate layered Photoshop artwork with a variety of video editing and compositing systems using the built-in Export Layers To Files command. Perform nondestructive scaling, rotating, and warping of raster and vector graphics with Smart Objects. Even preserve the editability of high-resolution vector data from Adobe Illustrator·- software. Select and move, group, transform, and warp objects more intuitively by clicking and dragging directly on the canvas. Easily align objects with Smart Guides. Design faster by automatically aligning objects to each other using Smart Guides. Quickly select typefaces from the font menu, which now displays a sample of each font. Work more smoothly across Adobe Creative Suite components with color-setting synchronization in Adobe Bridge, consistent viewing of onscreen color, and unified Adobe PDF file creation settings. Avoid typos with the built-in spelling checker, which supports multiple languages and includes convenient search-and-replace functionality. See your broadcast graphics as they'll appear to the audience, while you're still building them. With one click, you can preview your Photoshop images on a television monitor connected to your computer by IEEE 1394/FireWire/i.LINK. Make the most of systems running 64-bit processors. Photoshop can address approximately 3.5 GB of RAM on a Power Macintosh G5 running Mac OS X, a Windows XP 64-bit Edition system running an Intel Xeon processor with EM64T, or an AMD Athlon 64 or Opteron processor. Save time by processing batches of raw images at once with nondestructive editing, including color settings, cropping, straightening, adjusting curves, and more. Even process images while continuing to edit or retouch them. Take advantage of support for a comprehensive range of digital cameras, and help ensure a lifetime of access to your digital camera raw files by converting them to the DNG format. Instantly improve the appearance of images by automatically adjusting the exposure, contrast, and color of raw files. Quickly display your photos online and gather feedback from viewers using web photo galleries that can now also include animations and sound. Easily showcase your images by choosing from more than a dozen customizable Picture Package templates. Present your images in universally accessible Adobe PDF files, which include support for transitions and security options. Easily configure your desktop inkjet printer for accurate color output. Note: This download contains two files: '.exe' and '.7z'. Please allow the .7z file to download completely (100%) before launching the installer. When the .7z file has downloaded completely, double-click the '.exe' file to begin installing your trial. · Navigate to any area of an image with new, ultra-smooth zooming and panning. Maintain clarity as you zoom to individual pixels and easily edit at the highest magnification with the new Pixel Grid. And use the revolutionary new Rotate View tool to smoothly turn your canvas for distortion-free viewing at any angle. · Combine a range of images, each with a different exposure, color, and focal point - with options to preserve tones and colors - into a single color-corrected image. · Quickly create and edit masks from the new Masks panel. This panel offers all the tools you need to create editable pixel- and vector-based masks, adjust mask density and feathering, easily select noncontiguous objects, and more. · Enjoy superior conversion quality as you process raw images with the industry-leading Adobe Photoshop Camera Raw 5 plug-in, which now offers localized corrections, post-crop vignetting, TIFF and JPEG processing, and support for more than 190 camera models. · Easily create a single image from a series of shots that have different focal points with the enhanced Auto-Blend Layers command, which smoothly blends color and shading and now extends your depth of field, automatically correcting vignettes and lens distortion. · Enjoy dramatically enhanced color correction with reengineered Dodge, Burn, and Sponge tools that now intelligently preserve color and tone details. · Create accurate composites with the enhanced Auto-Align Layers command. Move, rotate, or warp layers to align them more accurately than ever before. Or use spherical alignment to create breathtaking panoramas. · Easily work with multiple open files by using tabbed document display or n-up views. You cannot download any crack or serial number for Adobe PhotoShop CS4 on this page. Every software that you are able to download on our site is legal. There is no crack, serial number, hack or activation key for Adobe PhotoShop CS4 present here. Our collection also doesn't contain any keygens, because keygen programs are being used in illegal ways which we do not support. All software that you can find here is freely downloadable and legal. Adobe PhotoShop CS4 installation package is prepared to be downloaded from our fast download servers. It is checked for possible viruses and is proven to be 100% clean and safe. Various leading antiviruses have been used to test Adobe PhotoShop CS4, if it contains any viruses. No infections have been found and downloading Adobe PhotoShop CS4 is completelly problem free because of that reason. Our experts on malware detection tested Adobe PhotoShop CS4 with various spyware and malware detection programs, including fyxm.net custom malware and spyware detection, and absolutelly no malware or spyware was found in Adobe PhotoShop CS4. All software that you can find on our servers, including Adobe PhotoShop CS4, is either freeware, shareware or open-source, some of the software packages are demo, trial or patch versions and if possible (public domain licence), we also host official full versions of software. Because we want to be one of the fastest download sites on the web, we host all the software including Adobe PhotoShop CS4 on our servers. You cannot find here any torrents or download links that would lead you to dangerous sites. 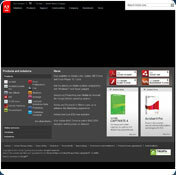 Rate Adobe PhotoShop CS4 11.0.1!